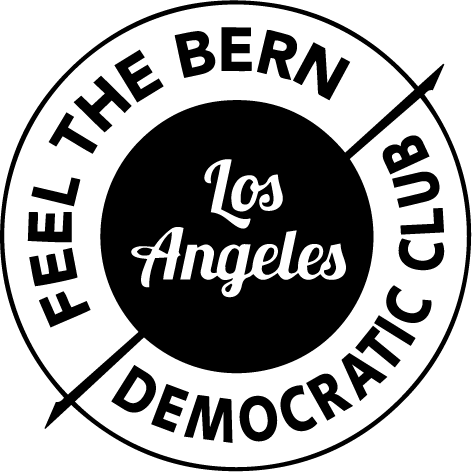 We are a chartered Democratic Club in LA County, created for Berniecrats by Berniecrats. We are dedicated to making sure the Democratic Party is one that has a firm foundation in the Grassroots and one that upholds left, progressive Democratic Party ideals. We are interested in not only responding to the actions and threats within the corporate Democratic Party as well as the Republican Party. The club intends to hold politicians accountable by being the first chartered L.A. club to issue endorsement agreements, which state that the Club may withdraw its endorsement of endorsed candidates if once in office they no longer uphold the mission statement of the Club, and we are the only chartered Democratic Club in Los Angeles County to insist potential candidates sign our Corporate-Free Candidate Pledge as a condition for endorsement from our Club. 1x month (4th Sun. of the month, typically 6:30-8:30pm) in and around the L.A. area. Follow us on Facebook for more details.